Troop 255 offers a year-round adventure-based program designed to develop and encourage effective character, citizenship, and fitness training for youth ages 11-17. In addition to camping, Scouts and adult leaders enjoy activities such as backpacking, mountain biking, canoeing, target-shooting, day hikes, as well as, giving back to the community through service projects and volunteering. 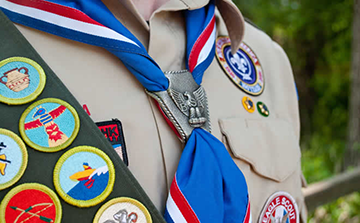 Troop meetings are held every other Wednesday evening at 7:00pm at the Half Moon Bay Yacht Club. Throughout the year our scouts have participated in white-water rafting, week-long camps and 50-miler hikes, mountain biking at Tamarancho and summers at Wente where they have the opportunity to earn merit badges in mountain biking, hiking, canoeing, wilderness survival camping, outdoor cooking, shotgun, orienteering, archery and many other activities. To learn more about joining Troop 255, click on Contact Us and send us an email.